Crazy Climber is a coin-operated arcade game produced by Nihon Bussan Co. Ltd (also known as Nichibutsu) in 1980. It is a 2-D, strategy style in which you must plan your moves as you climb up the building and anticipate the hazards that await you. The game was brought home on two second generation consoles in the early 80s, as well as the Famicom, and much later the WonderSwan and PlayStation. In Crazy Climber the player assumes the role of a daredevil, who is attempting to climb to the top of a skyscraper. You start out the game at the bottom of a building to be scaled. As you climb up the building, you will be assailed by bald people throwing flowerpots, signs with loose electrical wires, very large apes, falling signs, trash and barbells, and a bird that likes to drop bad things on your character. 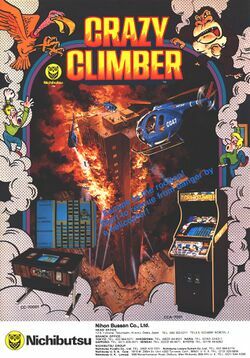 Once the climber reaches the top of the skyscraper, the player's objective is to grab the runner of a waiting helicopter for bonus points. The reward is also another building to climb, with more challenges awaiting. If the player completes all four skyscrapers, he is taken back to the first skyscraper, and the game continues to become more challenging. This page was last edited on 4 December 2015, at 21:05.